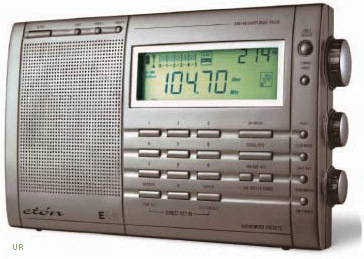 The Etón E10 is the a portable digital radio covering AM, FM and shortwave. The AM band may be tuned in 9 or 10 kHz steps and shortwave in 1 or 5 kHz steps. Getting around the bands is easy with: manual tuning, keypad entry, scanning or direct frequency entry. You can store up to 550 of your favorite stations or use the ATS (Auto tuning system) for automatic memory storage of AM and FM stations. Manual tuning my be set for slow or fast rate. The built in 24 hour clock has two turn-on timers and a sleep function. FM stereo is provided to the earphone jack and stereo or mono my be switch selected. There is also a Hi/Low tone control. Other refinements include: backlit LCD, Wide/Narrow bandwidth, External SW/FM antenna jack and flip stand. Click here to view radio side panels. The Etón E10 also provides two very special features. The first is called IF SET. This shifts the radio's Intermediate Frequency to minimize interference during shortwave reception. The second new feature is Antenna Trim. Rotating the antenna trimmer allows the efficient "matching" of the antenna to the radio. These two features were previously only available in advanced table top shortwave radios. The controls are easy to operate. The E10 may be system programmed to personal preferences and geographic location. 7.5 x 4.5 x 1.25 inches. 1.3 lbs. 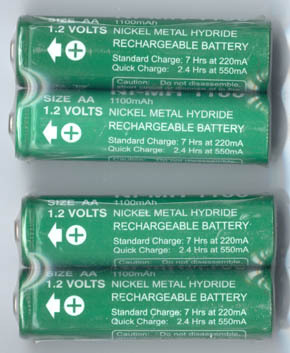 The E10 operates from four supplied rechargeable 1100 mAh Ni-MH AA cells. The AA cells can be charged inside the radio with the supplied AC wall charger. Includes manual, wrist strap, protective case, wind-up antenna, AC adapter and ear buds.